In a very misguided way, I decided that this movie probably sucked when it was a huge hit while being horribly reviewed in 2004. Never a fan of Jennifer Aniston, and real selective in my pursuit of the comic movies of Ben Stiller, I felt that I could live without it. And live I did. Quite well, thank you. Recently, my favorite local radio show out of the Miami/ South Beach area, The Dan Lebatard Show With Stugotz, they began referring to the movie in comparison to LeBron James. Hearing the description and repeated clips from the movie, I decided to give it a shot. Nice shot. We can feel that hair shirt from here. First of all, it is apparent from the first moments, when Seymour Hoffman’s Sandy Lyle slips on his toukus on the newly waxed floor, everyone is going after every shot in this one. The floor is being waxed for the wedding of his friend, Rueben Feffer (Stiller), whose marriage to Lisa (Messing) is not so obviously doomed from the start. They seem to get along, sure, but when scuba diving instructor Claude steals his wife during the honey moon, he is back in New York looking for a new start. His wing man, Sandy, is as helpful as a deluded, self-important former child actor can be, and when he discusses his chance meeting with former Middle School acquaintance, Polly Prince, naturally Hoffman advises him to move on. Then promptly throws up a series of bricks. “Let it rain!” he shouts as the shot flails towards the backboard. Let it rain, indeed. Hoffman becomes that wretchedly bad ball hog who infests every scrimmage court in our lives. Ben Stiller tries to stay competitive and to pay heed to his OCD at the same time. 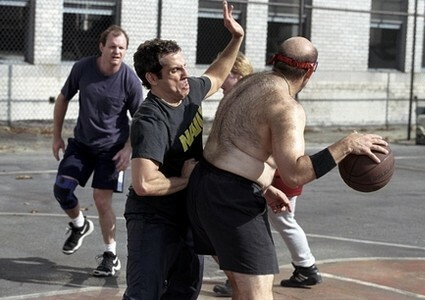 The basketball scene is hilarious, and brief. Any longer and it may have lost its humor. mentioned OCD . He also has IBS. He seems clueless, but sincere. These quirks are played not cruelly, but playfully. One of the best examples of this is the wonderful Alec Baldwin, playing his delightfully overbearing boss, Ira in the bathroom at work. It’s a fine line that writer/director John Hamburg delivers easily. As for Aniston, I really had no clue that it was possible to make her appear natural in front of a camera. She’s acquired such a collection of bad, habitual quirks, it was a true labor to watch. Here, she seems so open and into her character, she really sells the experience for once. The subtleties between the two leads present a real chemistry that is normally absent in romantic comedies. Hoffman is about as good as he normally is. Sandy Lyle’s past works well with the pompousness that Hoffman exhibits quite naturally. His scenes don’t overwhelm the film. Rather, they work well within the context. He is a wingman, not the whole force. The last quarter of the movie goes through the usual motions, but it flows as well as you could expect, with the elements involved, especially Hoffman and the pet Ferret, Rodolfo. This movie played as well the second time as it did the first. Hamburg also wrote and directed the equally funny, I Love You Man, in 2009. After seeing that film, and now this, I very much look forward to what he presents in the future.